Hello, handsome boy! Your face certainly does have many expressions, especially when you are meowing. I'm sure you will have a wonderful conversation with the judges at your first show. Good luck! Congratulations on being Cat of the Day and I wish you many many happy and healthy years with your people! Vanechka is the most cheerful Siberian cat on the planet. His face is so expressive and so emotional that everyone immediately falls in love with this boy. I hope you will also love our kitten Vanechka, he wants to talk now. Hi! My name is DARWIN of Russkaya Zabava, this is from the pedigree papers. and at home my mother calls me affectionately Vanechka. I'm a real Siberian cat, I have all the most famous lines in my ancestors. I live in a distant snowy Russia, in its capital Moscow, so I have such a rich coat. I am neutered, but it does not prevent me from attending cat shows, and soon I will go to my first exhibition. I'm a kind and affectionate cat, I like to play with toys, jump on a cat's tree and I also like to jump on my shoulders to my human mother and father and ride. They understand me! But while I'm very smart, I am also an obedient cat - my claws get sharpened only on the scratching post, I do not touch the furniture. I also have four brothers. One of them was left in a cattery for the breeding. At the end of my story, I want to give all the world's cats great greetings and wish them all a long and happy life! Hello, beautiful Vanechka in far-away Russia! Happy Cat of the Day! What a gorgeous fellow you are! Your ginger fur looks so fluffy and soft to pat! You have a very rich coat indeed! I like your sweet, expressive face too! You are a very active kitty- playing with your toys; resting on your cat tree and observing all that is going on. You go up to your people's shoulders to go wherever they are going! Then you can see even more of what is happening! You are careful to use the scratching post for your claws, not the furniture. Best of all, you are much loved! PURR-fect! Happy, happy Cat of the Day to Vanechka! Dearest Vanechka, also known as DARWIN of Russkaya Zabava, what a gorgeous Russian gentleman you are! That orange fur with the white mask around your face is so luxurious and looks so soft.. and just look at that tail! And what a sweet face you have with that cute pink nose and those lovely big eyes that match the golden orange of your fur. Thank you for sharing all those great photos with us! You are absolutely stunning in every one of them. I can see very well the champion show-cat you will be! I wish I could reach through the screen and all the way around the world to Moscow to pet you, and pet your four brothers, too. I can't, of course, but I know your loving and beloved family members will pet you all for me . And what a delightful personality you have! You are only eight months old, still a growing boy. You are already the most cheerful cat on the planet! Everyone you meet immediately falls in love with you. You enjoy playing with toys and jumping on your cat tree. You also like to jump up on the shoulders of your human mother or father and ride. You are a very good boy, only sharpening your claws on the scratching post, not the furniture. You and your dear family members all love each other very much, don't you. What a wonderful love-filled home you share! 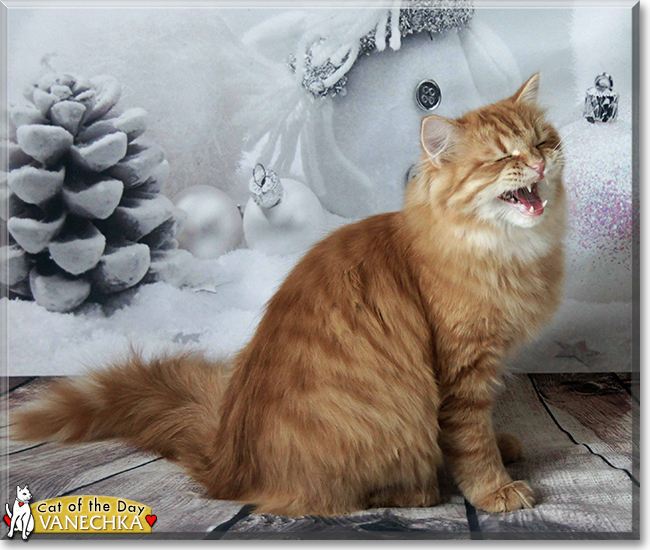 Congratulations, darling Vanechka, on being chosen today's Cat of the Day! We hope you and your dear kitty brothers and human parents and all your family and friends are enjoying a fine celebration, full of fun and lovies and all your favorite games and treats. P.S., We, the kitties here, Poppy and Sparkler, thank you for your great greetings to all the world's cats and wishes to all for a long and happy life. We send the same greetings and wishes back to you and all the others! We also send you our best wishes for your first exhibition and all those to follow. Last edited by phesina; 04-17-2018 at 06:38 AM. Greetings, DARWIN of Russkaya Zabava, a.k.a Vanechka! Happy Cat of the Day congrats to you! What a gorgeous, most expressive and photogenic Siberian Forest Cat you are, Vanechka! Your holiday themed photo spread is the best! Major kudos to your very talented photographer/mommy/daddy for capturing you in all of your feline fabulousness! Your coat is magnificent, and no doubt serves you well during those cold and snowy Moscow winters! Beautiful and photogenic, a natural for the camera, that you are, in addition to being packed with personality, smart and obedient! No doubt about it, you're going to wow the judges, once you hit the show circuit, Vanechka! But for now, your only job is being a loyal and loving companion, a source of never ending joy and smiles, for your mommy and daddy! How blessed they are, having a furkid as special as you in their lives! You're a treasure, Vanechka, and so very worthy of your day of worldwide celebrity! Thanks for pawing off a note to us, sharing your beautiful self, your heartwarming backstory and gorgeous photos with the world! Meeting you has made my evening! Hope you're enjoying a very special Cat of the Day celebration, sweetheart...riding on your pawrents shoulders, playing with your toys, being loved and pampered to pieces by proud family! Lots of love, cuddles and kisses to you, beautiful Vanechka, our very special and most deserving Cat of the Day, EVERY day! Long and happy life to you, sweetheart! And love to all of your kitty siblings, too! Dear Vanechka, what a handsome Siberian Forest boy you are. Your long, flowing coat looks so soft, and your face is so incredibly sweet. You are so very photogenic, posing like a professional model and ready for your first exhibition. Even though you are still a baby, you are well-mannered, only using your scratch post to sharpen those nails. You are also affectionate and playful, and you like to ride on your parents' shoulder. Vanechka, aka DARWIN of Russkaya Zabava, you are a beautiful and special kitty, and I wish you, your siblings and your parents a great day full of celebration, and many more happy and healthy years together. What a handsome Siberian Forest Cat you are, Vanechka. Best of luck at your first cat show. Congratulations on being honoured as Cat of the Day, Vanetchka! What a handsome Siberian Forest boy you are! Your fluffy orange coat with a white chest is beautiful, and so is your golden eyes. I so enjoyed seeing all your funny expressions on your sweet face. With a coat like that, I’m sure you won’t freeze, even in the middle of the cold snowy winter. How lucky you are to live with such a loving family, and you have four brothers to play with, also. I can tell you all love each other and have a lot of fun. You are affectionate and smart, and you don’t ruin the furniture with your sharp claws, but use your scratching post - I bet your family appreciate that. Enjoy a day of fun, celebration and playtime with your brothers, and get pampered with extra treats and lots of love. I wish you best of luck in the cat show, and a long, happy and healthy life, Vanetchka!